← Say Yes to Your Dress! Choosing a wedding invitation these days can be an overwhelming experience. Your invitation sets the tone for the rest of your wedding, so you should consider the type of message you want to convey. Is it a casual beach wedding or a formal affair? While traditional invitations are timeless and beautiful, if you’re intentions are for your bridal party to be wearing flip flops on the sand, maybe that’s not the best option! With so many invitations available, including stylish eco-friendly selections, where does one begin? While you could always opt to select something off the Internet, you’ll miss out on the tactile experience of being able to feel the texture of the paper and see the difference between several modes of print. 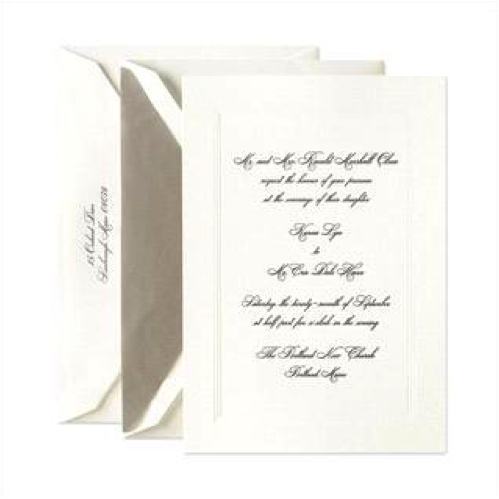 Purchasing from a store or invitation consultant gives you the opportunity to ask all of your questions, including time frame for purchasing, addressing and mailing the invitations. Not to mention, professionals can also help you determine the best quality for your budget. Type of printing – letterpress, embossing, engraving, etc. (a professional can help explain the difference to you and show you examples). This may be the only time in your life you get to spend this much time thinking about paper, so enjoy it! !